When chamber music is experienced in an intimate atmosphere, as befits its name, listeners may well be affected by sight as much as sound. The close proximity of players to each other as well as the audience allows the listener a peek at the intensely cooperative nature when all is good. The woodwind quintet intrigues more than, say, the standard string quartet because each musician wrestles and manipulates an instrument vastly different than her colleagues. Furthermore, the centrality of breath hypnotizes; rather than the choreography of bows on strings, it is the tutti breath that disintegrates into fiercely individual attacks that mesmerize. Vento Chiaro, resident in the Boston area for more than a decade, gave the final concert of its regular season on Sunday, May 31st. A small but enthusiastic crowd braved the Sunday downpour to reach University Lutheran Church, near Harvard Square. The large sanctuary was strikingly clad in Pentecost red; the minimalist chancel space served the chamber purpose well, and the small audience crowded near the front. Some of them were clearly family members and fellow wind players; perhaps they may have been familiar with the specialized repertoire. Not a wind specialist, I approached the concert knowing only two of the four composers. The unusual textures and unfamiliar repertoire came in a relatively short program that was delightful to hear and see. The interplay among the musicians was stellar, particularly with a new oboe (Elizabeth England replaced Ana-Sofia Campesino, who had a case of pregnancy that is expected to last a few more weeks). Only the tiniest ensemble discrepancies could be noted, and easily forgiven, coming at the end of a concert which ended a long season. The opening Humoreske, by Alexander Zemlinsky, was appropriately bouncy and irreverent, playful and tonal, kicked off by bassoonist Sam Childers. Independent lines danced around each other and occasionally met for a forceful tutti before swirling away. Throughout this work, the high voices felt restrained; not that the horn dominated, which must be a constant concern for quintets of this type, but just that the room seemed to allow the sound of horn, bassoon, and clarinet to bloom more. Vento Chiaro presents several concerts each year at University Lutheran, so they are clearly comfortable with the acoustics of the mostly-stone rectangular sanctuary. In any event, worries about balance vanished after the first piece. Brandeis’s Irving Fine (1914 – 1962) was the composer of Partita for Wind Quintet. In five mostly scurrying movements, each musician played with admirable tone quality and intonation. The near-constant independent voices of the early movements made the central movement, “Interlude”, a welcome respite with long tones. Likewise the “Coda”, where the horn led a plodding, restrained march. After the pause came the composers unknown to me. As announced from the stage, Bruce Adolphe is affiliated with Lincoln Center and perhaps best known as “The Piano Puzzler” on Performance Today. His Night Journey had, in the words of horn player Anne Howarth, an “interlocking engine” that drove the musical material. Like the pieces that preceded it, a sense of constant motion dominated, but the textures changed in endless combination of duets and trios. Arrestingly, both the Adolphe and the Fine ended with a clarinet decrescendo that sounded uncannily like the tolling of a bell; Chi-Ju Juliet Lai demonstrated technical mastery with the gesture. It made me wonder if the works were juxtaposed purposefully. Flutist Ona Jonaityte introduced the final composer Karl Pilss (1902-1979) by confessing that there was very little information available about him. She proceeded to give us everything she had: Viennese, influenced by Richard Strauss, lots of lieder, choral works, some wind quintets, and some symphonies. He was a choral director of some renown in Vienna, a fact I had not expected to learn at a wind quintet concert. This Serenade for Wind Quintet was marvelous: a pastoral opening, moments of real serenity, and some unusual tonality throughout. Certainly my enthusiasm is partly the result of the more “classical” texture; for nearly the first time that night, various instruments took a leading line with the others creating chordal accompaniment. My concert companion remarked on the harmonic resemblance to Strauss. After the frantic journeys of the first three works, the Pilss was a celebration of tone and harmony, and a pleasing closer. 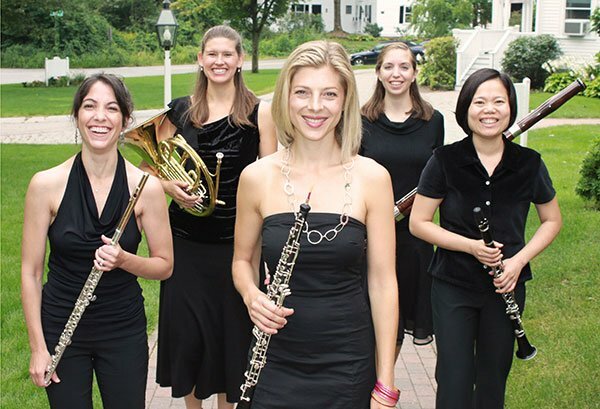 Since 2002 the woodwind quintet in residence at the Boston University Tanglewood Institute, Vento Chiaro will offer several concerts at Trinity Episcopal Church in Lenox this summer. Joshua Hawkins Nannestad is a professor of choral music education at Southeastern Oklahoma State University, and formerly a music educator in the greater Boston area.